Ancient Chinese knows how to counter the cold by collecting delicate snow flakes off the branches of plum blossoms and put them in clay urns. These urns are buried underground to allow the melting snow to settle. 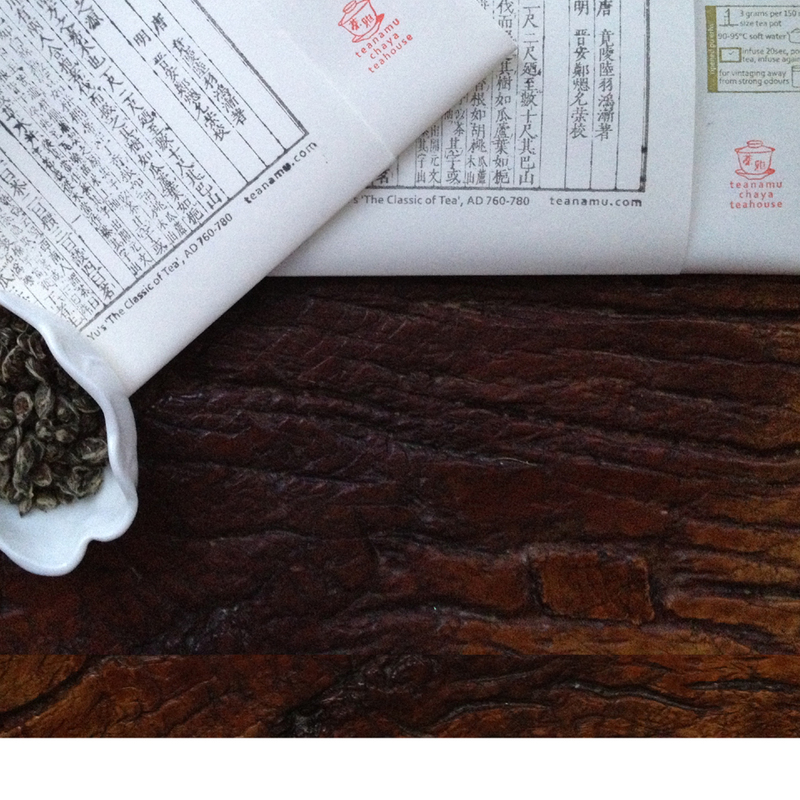 The melted snow water used for brewing tea is said to have a hint of plum blossom fragrance. 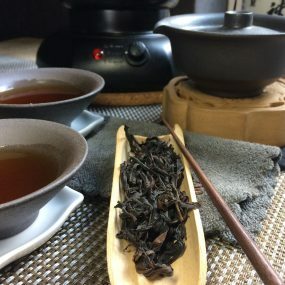 The following teas are excellent for this season of rest (with or without the snow water. Any left over tea or infuse used tea leaves in water instead of throwing it away. Use it to clean your eye lids to relieve redness, puffiness and dryness. You can also use it to rinse your mouth before your brush your teeth. In winter, as nature rests, we gather in our resources and energy to keep healthy, strong and resilient. In winter, the earth’s Yang energy goes into hibernation and is in restraint. The excess Yin energy gives the perfect opportunity to conserve our vigor to face next three seasons. In the Huangdi Neijing (黄帝内经 Yellow Emperor’s Internal Canon, medical text c. 300 BC), the three winter months yield the need for getting into bed earlier and waking up later (after the sun has risen). Our work and rest routine should get in tune with the earth’s winter routine. This longer amount of rest allow us to conserve our Yang energy and vigour. Get ready to sleep during the hour (10-11pm) when earth’s Yang energy from the day morphed into yin energy). This helps to conserve your Yang energy. Where possible, wake up after the sun has risen when the opposite happens to ride the wave of earth’s Yang energy. As a water element organ, our kidneys are believed to conserve and distribute Qi energy. One should try to nourish one’s kidney or tame the fire in one’s heart in winter. Those with a weaker constitution or those whose bodies are in a state of disharmony tend to have an accumulation of Yin energy in their kidneys. With the dry cold energy in winter, too much Yang energy in their bodies are consumed to achieve a harmony. This results in feelings of being light-headed, insomnia, anxiousness and general lethargy. One could consume chestnuts, ginger, sprouting soy beans, Yuzu and honey to strengthen the Yang energy in one’s kidneys. A good infusion for this season is Organic Golden Monkey black tea brewed with ginger and brown sugar. As we approach Christmas, one must strengthen our immune system and our lungs and kidneys to acclimatise to the increasingly lower temperatures. It is good to consume chestnuts, yuzu / pomelo, walnuts sesame and the more oxidised or vintaged teas. After the excesses of Christmas season, the constant cold makes our kidneys and heart work a lot harder. One should eat well and keep warm to maintain a sufficient level of Yang energy. Seasonal foods like clementines, yuzu / pomelo, grapes and ginger are good supplements for this season. Or try to drink a bowl hot soup every day. It is simple to assemble a nourishing chicken broth in a slow cooker or thermal pot (see recipe) ready for you to enjoy when you are back from work. TCM believes that we are governed by seven emotions and desires. This is the season to restrain these emotions to maintain a restful state. Learn to let go of your anger and frustrations. TCM believes salty foods burden our kidneys in winter time. So as a general rule, one should avoid excessively salty or salt-cured items. Here are a couple of recipes for you to try in this season. This dish nourishing the Yin strenghten the Yang. The cordyceps strengthen the kidneys’ Yang energy. The aged duck nourishes the Yin energy. Put all the ingredients into the cavity of the the duck. Place the duck into a dish together with some water and the shaoxing wine. Double boil for 2 hours or till the duck is tender. Serve hot and drink the nutritional broth. This dish helps those with tired lungs from dry coughs. It also helps to relieve tiredness. Score the shell of the dried chestnuts and put boiling water over them. When the shell and the papery skin of the chestnuts are softened, remove them. Heat some oil in a wok till barely smoking, fry the chestnuts for 3 minutes. Remove from the oil and set aside. In the same wok, add the spring onions and ginger, then pork. Brown the pork and then add chicken stock. Bring to a boil and add the chestnuts, dark soy and simmer till the pork and chestnuts are tender. This is a really easy recipe which really only require some assembling if you have a slow cooker or thermal pot. Dried Chinese yam (淮山, Dioscorea Opposita) nourishes your kidneys, spleen and lungs and can be purchased in Chinese grocers or herbal shops. The dried tangerine peels nourishes the lungs and relieves with any coughs. The best peels are those with at least 3 years of vintage. Place all ingredients, except for the salt, into a slow cooker and add water to just covering the ingredients. Let it cook gently for a good 5-6 hours. If using a thermal cooker, bring everything, less the salt, to a gentle boil for 15-20 mins. Take it off heat and place it in the thermal cooker and leave for 4-5hours. If using a steamer, place all ingredients, without the salt, with the water in a small crockpot. Steam it for a good 2-3 hours. Season with salt just before serving it hot. A very simple and quick soup to make if you are in a hurry. Add an egg to transform it into an egg-drop soup. Soak the Black Wood-ear fungus in some hot water. Cut into chunks. Put the mu er into a pot together with the goji berry and water or vegetable stock. Bring to a boil and simmer till the fungus is cooked. Add the tofu to warm through. Add salt to taste and sprinkle with spring onions. Cut the top ⅓ off and the tapering tail end of the mooli. Scoop the middle part of the mooli and save it together with the tail end for another dish. In the cavity of the middle section, put some rock sugar chunks and secure the top half to this middle section with toothpicks. Put this in an air-tight container and leave it in the fridge for 5-6 days to allow a nourishing nectar to form. Tip the nectar created by the rock sugar into a bowl and add some honey to taste. Here are a few acupuncture points you can give some TLC for a more comfortable winter. The great littérateur Su Dongpo (苏东坡, 11 Century) has a deep understanding of hair combing. He described in a poem that if one comb 50 times along the scalp just before night time and lay down with your hair undone, you can awake from a deep sleep next morning. This head massage can help reducing stress, improving blood circulation for a better night’s sleep. Pressing the Feng Chi acupuncture points on the two hollow areas where the base of your head joins the back of our neck. Press till the two acupuncture points feel warm and slightly aching. Bend your knees a little (no further than the tips of your toes). Then straighten your legs and stand on tip-toe. Hold for 5 seconds and put your heels down. 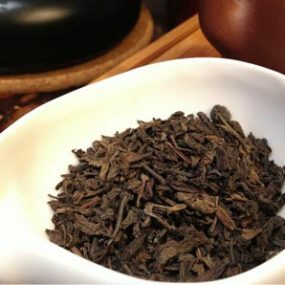 Add freshly boiled water to 2 or 3 grams of tea leaves in a small bowl roughly the size of a Chinese rice bowl. 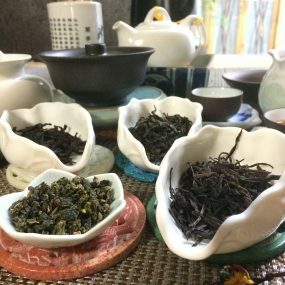 Choose a fragrant tea, if you can, like Lishan Oolong, or an mellow aromatic one like Emperor Pu Erh 1998 vintage. Position your face over the bowl and let yourself breathe in the steam. Use your hands to keep too much steam from escaping. 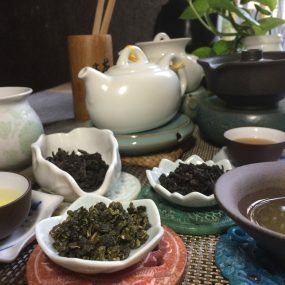 Enjoy this experience for 10 minutes, then you can sit up and drink the tea! Don’t forget, with a good quality tea, you can keep adding more hot water and brew the tea again and again. Traditional Chinese doctors believe that cold air enters the body via the feet. Hence, they encourage you to bathe your feet in warm water. After coming home from the blistering cold, do not immediately have a foot soak . Soaking your cold feet in hot water opens your pores and allow cold Yin energy to enter and stay in your body. Warm your foot by rubbing it first. Bathe your feet in tepid water. Then very gradually add hotter water. When the first drop of perspiration appears on the tip of your nose, drain away the hot water and dry your feet. Then lie in bed with the soles of your feet facing each other. Do this in as relaxed a way as you can, staying in that position for about 10 minutes. This will allow your Qi energy to flow more freely via the acupuncture point that affects the kidneys. After that, let yourself enjoy a night of blissful rest. Massaging the ‘Ying Xiang’ (迎香) acupuncture point, helps to strengthen your breathing system and relieve any nasal congestion. This acupuncture point is located on the one finger nail space from your left nostrils. The ‘He Gu’ acupuncture point (合谷) can helps to relieve any nasal sensitivities light headedness and tooth aches if you massages them frequently. Make a fist with your right hand, thumb side up and straightening your thumb. Using your left index finger or thumb, massage the flesh to the right of the base of your right thumb. Repeat the same for the He Gu acupuncture point on your left hand. Unblocking your ‘Zu San Li’ acupuncture points (足三里) helps to regulates your digestion and strengthens your immune systems . Your Zu San Li acupuncture point is about 4 fingers below your knee and about 2 fingers away from the centre of your knee on the outer biceps. Gently massage it with a finger till acupuncture poin feels warm. If your have access to moxa (dried mugworth) sticks, you can gently warm these acupuncture points with a lit moxa stick for a few minutes.